This knife set pays tribute to three of the most accomplished samurai in Japan's history! From top to bottom, the kanji inscribed blades showcase the name and family crest of these warriors: Tokugawa Ieyasu, Oda Nobunaga, and Date Masamune. 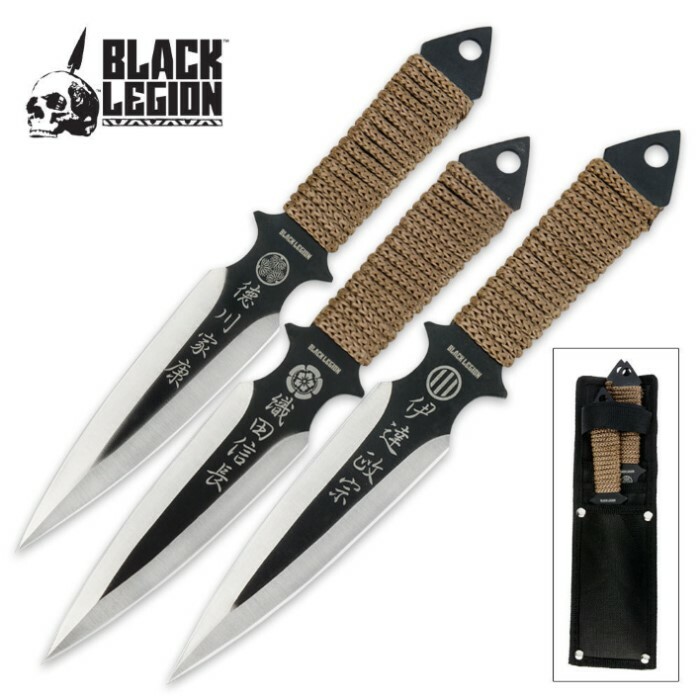 Features include the solid stainless steel construction, double edged blades, two-tone black and silver finish, pommel spike, and earth tone cord wrapped handled. 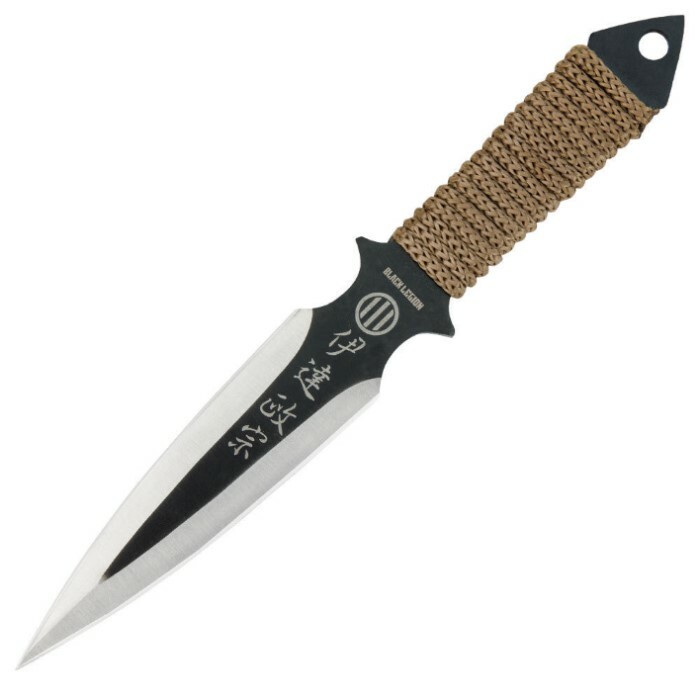 Suitable for both throwing use as well as a close quarters battle knife. If wishing to explore other throwing methods, a pre-drilled hole at the bottom of the handle allows for attaching a tail. Includes black nylon sheath with belt loop. Each knife measures 8 in. overall. Tokugawa Ieyasu (January 31, 1543 ­ June 1, 1616) was the founder and first shogun of the Tokugawa shogunate of Japan, which ruled from the Battle of Sekigahara in 1600 until the Meiji Restoration in 1868. Ieyasu seized power in 1600, received appointment as shogun in 1603, abdicated from office in 1605, but remained in power until his death in 1616. His given name is sometimes spelled Iyeyasu, according to the historical pronunciation of we. Ieyasu was posthumously enshrined at Nikko Tosho-gu with the name Tosho Daigongen. Oda Nobunaga (June 23, 1534 ­ June 21, 1582) was a powerful samurai daimyo and warlord of Japan in the late 16th century who initiated the unification of Japan near the end of the Warring States period. He lived a life of continuous military conquest, eventually conquering a third of Japan before his death in a 1582 coup. His successors were Toyotomi Hideyoshi, a loyal Oda supporter who would become the first man to unify all of Japan and was thus the first ruler of the whole country since the Onin War, and later Tokugawa Ieyasu, who would consolidate his rule under a shogunate, which ruled Japan until the Meiji Restoration in 1868. Date Masamune (September 5, 1567 ­ June 27, 1636) was a regional strongman of Japan's Azuchi-Momoyama period through early Edo period. Heir to a long line of powerful daimyo in the Tohoku region, he went on to found the modern-day city of Sendai. An outstanding tactician, he was made all the more iconic for his missing eye, and Date was often called dokuganryu, or the "one-eyed dragon". These Knives came in pretty quick, I received them as a gift and have to say they are pretty awesome!!! I've been throwing these knives for about an hour a day for 20+ days and these knives are fantastic. They aren't too heavy, and they're great for 1/2 spins and full spins. The handle wrap is cheap and will come off within 3-4 days of throwing, but once you get rid of that wrap like I did, and start to re-learn the weight balance of the knives themselves, these knives soar. Definitely recommend for beginners.